Take The Rapid Renewal Challenge! The harsh winter cold of Iowa brings excessive dryness to two of my children and we have to be vigilante about putting on lotion daily. Priscilla has no problems with remembering to do this, probably because she is the girliest girl you will ever meet and she loves smelly lotions. Manny on the other hand needs to be reminded to lotion up and even then, it’s like pulling teeth. When preparing for Manny and Priscilla to come home, I was researching what hair care and skin care products to use. With so many products out there and feeling overwhelmed, I asked a Black friend for her recommendations. I didn’t need to order anything online or spend a fortune on some lotion with rare ingredients because she recommended any Vaseline brand lotion (and we’ve been using it ever since)! 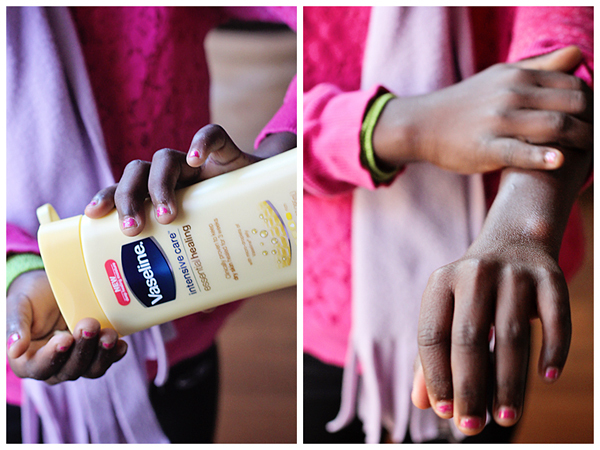 Priscilla took the Rapid Renewal Challenge, by using the new Vaseline Intensive Care Lotion. Enter below for your chance to win a $50 Family Dollar gift card. This stuff works awesome, I love the idea of a challenge to get less dry skin this Winter. Sadly my skin takes a beating in the winter time! I could really use this product with the weather we have been having lately! So harsh and cold! I’ve got a bottle sitting right next to me. I love Vaseline Intensive Care. I have to try this. My hands are already a wreck, and it’s not really even cold yet. I swear by Vaseline Intensive Care lotion to soothe rough, dry skin. Thanks for sharing this coupon. I have such hands with the cold air on us. My kids have dry hands as well. I need to take the challenge. These products work well for us too. They’re a lifesaver around this time of year. My husband works outside, and we get a lot of use out of Vaseline lotion. Especially during the winter. It is good stuff. Goodness I need some rapid renewal! Thanks for the great review and I’ll need to go grab some Vaseline products! Thanks for the giveaway, too. I just took the challenge with the sensitive skin formula. It was pretty good. I tend to stick to Vaseline products as they don’t make my sensitive skin break out like some other brands do. My dad always used the vaseline brand lotion. I need to get some for my dry hands! They are cracking from all this dry weather! My hands are always so cracked during the season. I’ll have to try this new Vaseline lotion! We love Vaseline in our house! I prefer the Cocoa Butter kind- the smell makes me think of summer no matter how cold it is outside. I’ve always been a big Vaseline fan. It does a great job of moisturizing without being greasy. I love Vaseline Intensive Care lotion! I actually have the same one sitting on my nightstand and I lotion up every night before bed. It get so dry here during the fall months when humidity drops. Just love Vaseline products. All great to use. My skin gets so dry this time of year. I think I need to head to Family Dollar and pick up a bottle! Love this stuff. I use it Daily and my skin feels great. This stuff works awesome. Sometimes you just have to trust the classics. Vaseline has always had great products. Inexpensive as well. Vaseline is the greatest hand lotion ever. I love that stuff. I wish we had a family dollar near by! I love Vaseline lotions it’s so wonderful and leaves my skin feeling awesome! I love Vaseline products. They have been my favorite for years. I need to pick up some of this myself. I have a Family Dollar near me too! Vaseline products have always been my go to for dry skin and lips. They work so well and so fast. I’m a huge fan of Family Dollar! Can’t wait until they finish building one in my city! I love Vaseline and Family Dollar both. Vaseline is one of my go-to lotions during the cold months! There are only two brands that I can use on my skin and that really work, Vaseline is one of them. I’m out and need to pick up some, too. My skin is already so dry from the early winter-like weather we’ve been having. Vaseline is one of the best products I’ve found for dry skin. Forget those excessively expensive products from premium brands. Vaseline has been around forever for a reason! We have a Family Dollar in our town – I love shopping there for cute accent items. I have used Vaseline products for years. They work so well.